*Annies Ruby Slipperz: HUGS are WONDERFUL!! I love to give hugs!! it's such a wonderful story, tho... it's worth revisiting. after being born 12 weeks early...the other was not...she was dying. improved almost immediately...they both went home...healthy! A hug helps TWO hearts at once...the hugg-er and the hug-ee. reduce the unhealthy effects of stress and cuts risk of heart disease! I just had to say it again! I try to ask a person first...before I wrap my arms around them. I guess...some people don't like hugs. I usually ask if they would let me give them one. my (89 pound) Bullmastiff "puppy" many times each day. you might find me hugging a favorite stuffed animal. as I fall asleep in a hotel or other location. What do you think about these wonderful hugs? Are you an "all the time" type hugger? Or, do you prefer only hugging those closest to you? Do you hug your pets often? What or who have you hugged today? It's fun for all those who visit if you share your comments! HUGS for all those who drop by to visit now and then. 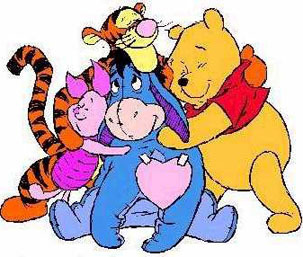 HUGS to all of my followers! Love your post today. I'm a hugger! Great post! I'm sort of a hugger - it's hard not to be in the South! I won't say I hug everyone, but I hug a lot!! I'm a sometime hugger. I do hug my two pups several times a day and my hubby too. When I was growing up - hugging wasn't something we did in my family but I'm learning - ever so slowly. I don't overly hug, but I do hug. Nice post. I apologize for an earlier comment from an annonymous commentor...using profanities. =( The post has been deleted. *sniff* that is so adorable about the twins. I'm developing into a hugger but I'm still a bit surprised by compulsive huggers who just grab you with no warning! I have a co-worker who fosters mastiffs. She is up to 14 dogs with the mastiffs and the 10 she already owns. Yikes. That is a lot of dogs and big dog to boot. I gave my little chihuahua mixes a hug and the hub.